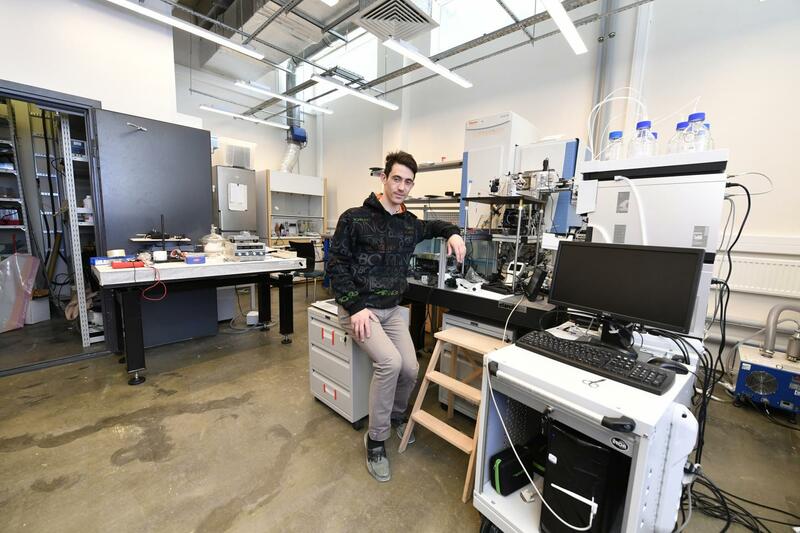 Researchers from Skoltech and MIPT have developed a device for upgrading mass spectrometers, which are used to analyze the chemical makeup of unknown substances. The new device analyzes one substance from four different perspectives. Alternatively, it enables multiple samples to be examined simultaneously. By contrast, conventional mass spectrometers analyze one substance at a time. The research paper was published in the journal Analytical Chemistry. Mass spectrometry is the most efficient way to determine the chemical composition of an unknown mixture. To do this, first the molecules making up the mixture are ionized. That is, some of their electrons are ripped off, imparting the molecules with an electric charge. These charged molecules, or ions, respond to electrical and magnetic fields by deflecting the trajectories of their motion. The greater the charge and the smaller the mass of an ion, the more it is deflected. This effect can be used to separate ions based on the ratio between their mass and charge. A mass spectrometer is a device that measures the mass-to-charge ratios of the ionized molecules in a mixture. That way, its chemical composition can be determined. A mass spectrometer has three basic components: First there is the ion source, where the molecules are ionized. This is the element that was refined by the authors. Then there is the mass analyzer, which separates the ions based on their mass and charge. Finally, a detector records the information about the ions. Mass spectrometry is ubiquitous across the industries and sciences. It is used to identify the composition of mixtures in pharmaceutics and metallurgy, as well as in the nuclear, oil and gas, and cosmetic industries. It dominates doping control. The list of applications goes on: Basically, wherever there is a chemical or biochemical mixture whose composition needs to be analyzed, mass spectrometry is the go-to option. Although the mass spectrometer was invented more than 100 years ago, researchers continue to refine the method by making it more effective and universal, and less time-consuming. "Mass spectrometry is a powerful analytical technique. Basically, it works by ionizing molecules and then measuring their mass. The first step, ionization, is when the substance changes into a gaseous state. This stage is fairly problematic, because a mixture can contain substances that require different techniques to be ionized," explains professor Evgeny Nikolaev of Skoltech and MIPT. "For the first time, we have combined five techniques in one mass spectrometer. [Editor's note: No. 5 refers to thermal decomposition.] This enables us to analyze mixtures in unprecedented detail." In electrospray ionization, a liquid is ionized in a strong electric field and then turns into a gas. First, a substance in the form of a solution is electrified in a capillary — a tube having a very small bore — by a high voltage measuring 2-5 kilovolts. A charged droplet leaves the capillary and moves in an electric field, disintegrating into many smaller charged droplets. As the solvent vaporizes, the substance that is being examined also changes into the gaseous state. This method works best with proteins and petroleum products. Besides, there is a more delicate variation on the same technique, called native electrospray ionization, which is used to analyze proteins without changing their natural 3-D structure. Atmospheric pressure photoionization uses high-energy photons — the particles of light. A photon carrying 10-40 electronvolts of energy can cause ionization in two ways: Either a molecule absorbs a photon and then ejects an electron, or this happens to a chemical that is introduced into the mixture. When ionized, that chemical in turn ionizes the molecule by reacting with it. This technique is potent for analyzing hormones and crude oil. Electron impact ionization works by bombarding the sample with electrons resulting from a beta-decay. This method first ionizes the molecules in the surrounding air. The resulting ions interact with the substance that is being examined, ionizing it. The newly proposed device makes use of all four of the techniques, yet the associated processes occur independently in separate spaces, so as not to affect one another. A further benefit of this modular design is that the device can accommodate even more ionizers. According to the authors, their mass spectrometer switches between modes in a mere second. It can thus be used to conduct separate experiments simultaneously. Alternatively, the device can analyze one substance in great detail by using all of the ionizers on it. In this setup, the mixture in one ionization channel can be used as a reference sample, while the remaining channels accommodate molecular reactions such as deuteration or ozonation. (The first refers to substituting hydrogen atoms in water molecules with deuterium, and the second means oxidation via exposure to ozone molecules.) In addition, the creators of the new mass spectrometer built in an option for controlling the temperature of the sample, which can also be used to thermally decompose it. "In the future, this device will enable analytical chemistry operations to be parallelized, which would be completely analogous to the way computations were parallelized in computer science long ago," says Yury Kostyukevich, a researcher at Skoltech and MIPT. "In this analogy, each ionization source acting on a certain fraction of the sample is like an individual processing unit performing computations. The mass spectrometer combines the data from all sources and outputs it to the researcher." The authors have already demonstrated that their device can simultaneously analyze oil and biological molecules in their native states, as well as support deuteration. This new mass spectrometry solution has the potential for widespread scientific and industrial application.